When any nation mistrusts its citizens with guns it is sending a clear message. It no longer trusts its citizens with guns because such a government has evil plans. A few days ago I saw a couple of fair-skinned young middle class Americans doing their normal shopping at a supermarket. She was blonde. Both of them were smiling. He was carrying an AR-15 on a sling. 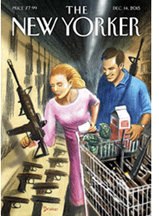 She had a shopping list in her left hand and in her right hand a AR-15 semi auto rifle she had selected from the many rifles and pistols available in the store’s shelves, apparently with the intention of adding it to the hand grenades, M-16s and a carton of milk they already had in their shopping cart. Where did I see this couple? On the December 14, 2015 cover of The New Yorker magazine. This tendentious, disinformative, deceitful cover is not a mistake or accident. It evidences the current mindset of the Invisible Government of the United States as reflected in the mainstream media they fully control. The New Yorker’s cover depicts not what it is but what the CFR conspirators and their minions in the U.S. government and the mainstream press would like it to be. In the minds of America’s domestic enemies in the U.S. government and the mainstream press, these young middle class of fair-skinned Americans, most likely Christians, were the ones who should have assaulted commando-style the social services center in San Bernardino where people, including a young, nice Muslim couple, Syed Rizwan Farook and his wife Tashfeen Malik, would have been peacefully having a party in a room with copies of the Koran on every table. The Christian fanatics, faithfully depicted in The New Yorker’s cover, systematically would have killed 14 unarmed people and wounded 21. Later, the police would have found they also had at home copies of the Bible and the U.S. Constitution, as well as 12 pipe bombs, tools to make explosives, and over 4,500 rounds of ammunition. And this couple of terrorist Christians would have bought all these guns, ammo and explosives at their local supermarket. Had this been the case, the CFR puppet in the White House would have immediately condemned the attack as a hate crime, calling it a case of terrorism, and announced his plans to sign an executive order banning Christians from owning any type of guns — according to Obama Christianity is a religion of hate. The impostor at the White House would have even hinted at the possibility of depriving Christians of their U.S. citizenship, interning them into reeducation camps and expelling from the country the recalcitrant ones who refused reeducation. Unfortunately, despite all efforts from the U.S. government and the mainstream media, life does not always go according to the CFR conspirators’ plans and the wishes of their minions in the U.S. government. Nevertheless, when life refuses to back their distorted views, they use the corrupt presstitutes on their payrolls to change life — at least changing it in the American sheeple’s brainwashed minds by using untruthful covers like the one that appeared in The New Yorker. Why is the U.S. government so reluctant to fight Muslim terrorists on American soil and abroad? Why is our government secretly supporting them with money and materiel? Why does the U.S. government not want to see who the real terrorists in America and the Middle East are? The answer is very simple: because Muslim terrorists have never been a problem for the globalist conspirators who secretly control the U.S. government. Actually, Muslim terrorists, mostly a U.S. government creation, have become a useful tool in the hands of the CFR globalists in their role of terrorizing the people into accepting a world government as the only solution to eliminate terrorism. To the CFR globalist conspirators the real enemy is not fanatical terrorists but the American (and now the Russian) people who refuse to get terrorized. Want to see proof of it? Here it is from the horse’s mouth. A U.S. Department of Homeland Security report of 16 March 2009 (unclassified, but for official use only) prepared by the DHS’ Strategic Analysis Group and the Extremism and Radicalization Branch, Homeland Environment Threat Analysis Division, “Domestic Extremism Lexicon,” makes it very clear who the enemies of the Secret Government of the U.S. truly are. According to the Report, if one is to believe the Department of Homeland Security and the Southern Poverty Law Center who provided most of the research data for it, the main terrorist threat in America today is not militant Islam but Christian “fundamentalists,” Oath Keepers, Iraq and Afghanistan war veterans, Tea Partiers, 2nd Amendment supporters, “Constitutionalists,” abortion opponents and everybody who does not accept the lies advanced by CFR agents infiltrated in the U.S. government. Paradoxically, despite their constant claims of patriotism and respect for the Constitution, “conservative” Republicans have always been eager to justify the trashing of the Constitution — provided the trashers are members of the Republican Party. They loved it when George W. Bush approved the Patriot Act, one of the most antipatriotic laws ever signed by an American President, after having been passed without even a perfunctory reading by a Congress with a Republican majority. I fully understand why Democrats who hate this country re-elected Jerry Brown as governor of California. What is difficult to understand, however, is why Arizona Republicans keep reelecting John McCain to the U.S. Senate. CFR member McCain has shown many times his hatred for this country. While in Congress, he has supported almost every anti-American law ever conceived. His latest act of treachery is his support for the National Defense Authorization Act, a bill later signed into law by Obama. When, following the CFR conspirators’ orders, George W. Bush created the Department of Homeland Security, allegedly to protect the U.S. against terrorism, and began curtailing individual liberties, most of his Republican followers backed him. They approved the creation of the DHS, they claimed, because they themselves were not terrorists and had nothing to hide. If John McCain and George W. Bush are true conservative Republicans, please count me out! Very soon some of these “conservative” Republicans who love Bush and McCain are going to learn the hard way what everybody who has lived under a totalitarian dictatorship knows very well: a terrorist is anybody the government accuses of being a terrorist, and anything you have in your home, from gardening books to dog food, not to mention a Bible, a copy of the Constitution, the Bill of Rights or — heaven forbid — a firearm, can be construed as a proof that you are a right-wing extremist and a dangerous potential terrorist actively conspiring against the government. A totalitarian America is an old, cherished dream of the CFR globalist conspirators and their minions on both the Left and the Right, and this is not he first time they have given it a try. When at the end of WWII General William Donovan (CFR), following orders from the CFR conspirators, urged the conversion of the Office of Special Services into a central intelligence agency, the public outcry stopped him short. Some critics rightly pointed out that America did not need a Gestapo. Eventually, the conspirators succeeded in the creation of the CIA, but some true patriots managed to include a provision that the new intelligence agency could not operate inside U.S. territory. But the conspirators are patient, and eventually have made their cherished dream a reality: Finally, they have created a government agency whose only purpose is to legally harass the American patriots who oppose the destruction of their country. This agency is none other than the Department of Homeland Security, a true American Gestapo. The creation, under the pretense of fighting terrorism, of a government agency to repress dissidence is wrong, whoever, liberal or conservative, created it. Therefore, We the People of the United States should demand the immediate elimination of this repressive organization that has no place whatsoever in a free representative Republic. The CFR brainwashers have created the notion, repeated over and over by Hitlary and the mainstream media presstitutes, that Donald Trump’s criticism of Muslim terrorists has turned him into a recruiter for ISIS. Well, if the National Rifle Association had a sense of humor, they should make Obama an honorary member of the NRA. Every time Obama mentions his plans to sign more gun control laws, gun sales skyrocket and the NRA membership grows. The least they should do is to express their gratitude to him. Moreover, gun store owners and firearms manufacturers should launch a campaign to reelect Obama for a third term. I know that they hate the guy as much as I do, but nobody would dare to criticize them for wanting their businesses to prosper. Just recently, Swiss Army Chief André Blattmann told Swiss citizens to arm themselves to fight terrorism and chaos. 6] In contrast, after the 9/11 events George W. Bush never told Americans to arm themselves and even took steps to disarm airline pilots. Now, why is the U.S. government desperately trying to disarm American citizens? A long time ago George Washington answered this question: because the government has evil plans. 1. I don’t use the term “administration” because, even though the administrations change, since Wilson’s time the U.S. government has always been the same. 3. This report was updated in later Department of Homeland Security Report titled "Right-wing Extremism: Current Economic and Political Climate Fueling Resurgence in Radicalization and Recruitment," dated April 7. 6. See, Robert Farago, “Swiss General to Citizens: Arm Yourselves, Europe’s On the Verge of Civil War,” thetruthaboutguns.com, January 3, 2016, http://www.thetruthaboutguns.com/2016/01/robert-farago/swiss-general-to-citizens-arm-yourselves-europes-on-the-verge-of-civil-war/.